What is Hosta virus X? Hosta virus X (HVX) is a viral disease that causes serious problems on many hosta cultivars, including, but not limited to, ‘Gold Standard’, ‘Guacamole’, ‘June’, ‘Patriot’, ‘Paul’s Glory’, ‘Regal Splendor’, ‘Sagae’, Striptease’, ‘So Sweet’, and ‘Sum and Substance’. Since its identification in 1996, nursery owners and gardeners in the United States have voluntarily destroyed large numbers of hostas to help prevent the spread of HVX. type and severity of symptoms that eventually develop depend on the cultivar. Not all hosta cultivars show symptoms and in some cultivars, symptoms do not develop until after the first year of growth. 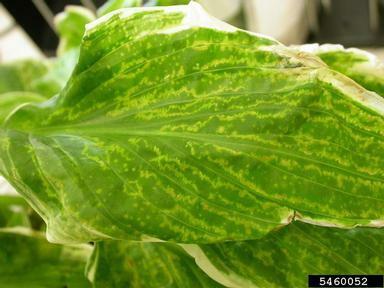 When symptoms are present, they can include light or dark green discolorations along leaf veins, green and yellow mottling of leaf blades, puckering, circular discolored areas (called ringspots), and in some cases, wilting and tissue death (necrosis). Symptoms are easier to distinguish in gold-colored hosta cultivars than in green cultivars. When symptoms are subtle, holding an infected leaf up to the light and comparing it to a healthy leaf can make symptom identification easier. Where does Hosta virus X come from? HVX is caused by a plant virus of the same name (i.e., Hosta virus X). This virus only affects hostas. HVX is typically introduced into a garden on new, often asymptomatic hosta transplants. The virus can then be spread from hosta to hosta by use of garden tools (e.g., pruners, shovels, knives, string edgers) and other items that have become contaminated with the sap of infected plants. Many growers are unaware that their hostas are infected and because of this, unknowingly move HVX from hosta to hosta in their garden or nursery. How do I save a plant with Hosta virus X? Once a plant has become infected with HVX, it is infected for the remainder of its life. There are no chemical treatments to eliminate the virus. Although a grower’s first instinct is to prune diseased leaves from a symptomatic plant, this can lead to spread of the virus if contaminated pruners are then used to trim other plants. The only way to eliminate the disease is to destroy infected plants (and any associated plant debris) by burning (where allowed by local ordinance) or landfilling. DO NOT compost hostas with HVX. • 14 dry ounces of trisodium phosphate in one gallon of water. These ingredients can be ordered on the internet. If you opt to use SLS, be sure to wear gloves and safety goggles, and mix the solution in a well-ventilated area as SLS is a known skin and eye irritant. Once treated, rinse items with sufficient water to remove any residues. Proper sanitation is critical for preventing the spread of HVX, as well as other plant viruses. For more information on Hosta virus X: Contact your county Extension agent.